What a rich and wonderful story–and one that poses very clearly the question of what history of books and readers can do for modern intellectual history (and vice versa). At Princeton, the acquisition of Derrida’s library will afford others a different way in the same set of problems. Oddly enough, one of those “free and cultured men beyond the sea” was my father, who dedicated one of his columns to a great salute to Mann, on the occasion of his arrival in the States. We have a noble reply from Mann to my father: a treasure of the civilization that survived those years, somehow. How wonderful, Tony! Could you ever be prevailed upon to share either your father’s column or Mann’s response? The republic of letters in wartime would make for a wonderful post, or even better a book one day …. 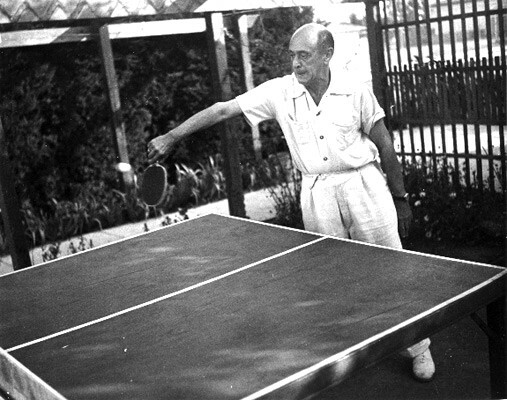 I’m also still fascinated by Mann’s landing in Princeton (even beyond the thought of him hanging out with Schoenberg in California, where the great composer also apparently enjoyed playing ping-pong … http://gapyx.com/cmt/2009/11/schoenberg_pingpong_1930.jpg ). I know that a great living novelist has written a book about this period. But then again, that whole town has a wonderful history from the Frankfurt School’s quartering there to the 1966 meeting of die Gruppe 47 (http://german.princeton.edu/landmarks/gruppe-47/), &c. Some good people have written about Mann in America, but mostly from the point of what he did rather than whom he met—and I’m not sure that latter’s a less interesting story.